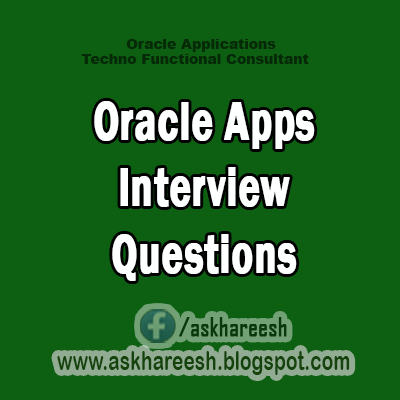 211) How do you set profile in oracle applications In Application Developer responsibility? 212) What is the syntax for loading data through SQL * Loader from multiple files simultaneously? 213)Give the relation between categories and items table? 214)In which tables are the categories of an item stored? 215)Significance of ALL in apps tables? Tables which are related with Multiorg is suffixed with ALL. 216) Explain about flexfield in GL.In what way it is useful? KFF is a set of segments, each segment will identify a unique characterstic of an entity. it can be termed as intelligent key. we can define our business requirements without doing any programming. A DFF is a set of segments which can be used to capture extra info. without any customisation. 218) What is TCA (Trading Community Architecture)? Oracle Trading Community Architecture (TCA) is a data model that allows you to manage complex information about the parties, or customers, who belong to your commercial community, including organizations, locations, and the network of hierarchical relationships among them. This information is maintained in the TCA Registry, which is the single source of trading community information for Oracle E-Business Suite applications. 219) Difference between Application Developer and System Administrator? 220) Request Set and where do you define it? Request sets allow you to submit multiple requests together using multiple execution path. A request set is a collection of reports and /or programs that are grouped together. A stage is a component of a request set used to group requests within the set. All of the requests in a given stage are executed in parallel. Advantages of stages are the ability to execute several requests in parallel and then move sequentially to the next stage. A request security group is the collection of requests, request sets, and concurrent programs that a user, operating under a given responsibility, can select from the Submit Requests window. 222)Registration of PL/SQL with parameters? Create the procedure in the module specific schema. Create a public synonym for that procedure in the Apps schema. Create the executable for that procedure. Attach the concurrent program to that procedure. Oracle Application Object Library uses values, value sets and validation tables as important components of key flexfields, descriptive flexfields, FlexBuilder, and Standard Request Submission. When you first define your flexfields, you choose how many segments you want to use and what order you want them to appear. You also choose how you want to validate each of your segments. The decisions you make affect how you define your value sets and your values. You define your value sets first, either before or while you define your flexfield segment structures. You typically define your individual values only after your flexfield has been completely defined (and frozen and compiled). Depending on what type of value set you use, you may not need to predefine individual values at all before you can use your flexfield. You can share value sets among segments in different flexfields, segments in different structures of the same flexfield, and even segments within the same flexfield structure. You can share value sets across key and descriptive flexfields. You can also use value sets for report parameters for your reports that use the Standard Report Submission feature. 225) How to define a value set depending on other value set? Navigation Path: Login -> AOL -> Application -> Validation -> Set Select the validation type as "Dependant" and click on „Edit Information‟ button. In Dependant value set information screen mention the Independent value set name.